Spring is in full force, as are the friends and family sales. It amazes me that nobody comes up with a different name for this. If it's not for friends and family, it's some sort of "stimulus package." Anyway, until April 14, you can receive 30% off Ralph Lauren both in stores and online. To receive your discount, click, print, and bring this coupon to any Ralph Lauren, RRL, Rugby, or Polo Ralph Lauren factory store, or use promotional code RLSP2009 at www.ralphlauren.com and www.rugby.com. And if you feel like sharing it with your friends and family, go for it. It's not easy to remember to buy greeting cards on time, especially if it's for a holiday other than a birthday or Christmas. E-cards are simple and quick, but they can also be impersonal and mistaken for SPAM. Considering this, Hallmark now offers 5x7 folded paper cards that can be ordered online and sent by mail to the recipient of your choice. It's actually pretty fun, you get to pick from different styles of paper, designs, messages, and can even add your own pictures and personal greetings. So, where does the free come in? Until April 12, you can send one personalized 5x7 card from Hallmark for free, by using the promotion code "TRIAL" at checkout. The promotion includes postage and taxes, and is restricted to one per person. If you haven't visited Style.com lately, there have been a lot of changes, mainly that it's now the online home of Vogue. Style.com is encouraging readers to join the Style.com community, which allows you to comment on blogs, chat in forums, and edit, publish, share and rate lookbooks. For registering at Style.com, you'll be entered to win a $1,000 gift card for H&M. In addition, 10 second prize winners will win a $100 gift card. Need a surge of youth? Clinique is giving away gift packages in the Clinique Youth Surge Instant Win Sweepstakes. Enter daily through April 30th to win the following items: A full-size Clinique Youth Surge SPF 15, portable Clinique compact mirror, one-year subscriptions to Bon Appétit and Self magazines. If you're a big fan of J. Crew, but not the price tag, now is the time to break out your wallet. Through April 2, J. Crew is offering an additional 30% off all final sale items. All you have to do is enter code "Extra30" at checkout. The first Wednesday of every month is free day at The Exploratorium in San Francisco, which means April 1st is free! The Exploratorium is a fascinating museum about science, art and human perception. Learn about the science behind everyday life, such as climate change, earthquakes, language, sports, cooking, and much more. The museum is enjoyable and educational for kids and adults of all ages. If you can’t make it, be sure to schedule it next month. If you’re not from the Bay Area, plan your next vacation around it. A family of four would save at least $46 on admission. But remember, free admission draws heavy crowds, so get their early, and be ready to have a LOT of patience! Urban Outfitters can easily be defined as cool, so I'd imagine an entire mix of 21 free tracks from Urban Outfitters to be even cooler. You can download the full mix of LSTN #4 at the Urban Outfitters blog, including songs by the following artists: Miike Snow, Jack Penate, Foreign Born, Teleki-nesis, The Pains of Being Pure at Heart, Lissy Trulle, White Rabbits, Mos Def, The Whip, The Golden Filter, Mapei, Little Boots, Prefuse 73, Dan Deacon, The Vaselines, Wavves, Tiny Masters of Today, Crystal Stilts, Sleepy Sun, Beach House, and Suckers. Need more travel-friendly samples? Here's a shampoo/conditioner sample of the new Aveeno NOURISH+ Hair Care Collection. Just fill out a brief survey, and choose from the items listed below. The first 1,000 entries will receive full-sized bottles. It's happened to me more than once. 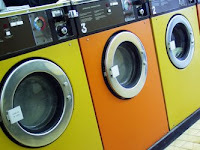 I get to the laundromat, unload my car, then realize I forgot my laundry detergent. At that point, my only choice is to buy a bottle marked up 300% at the liquor store, or, buy laundry detergent samples from the vending machine. So, my question is, why buy what I can get for free? Here's a couple of free detergent samples you won't have to buy, plus, they'll be mailed directly to your house! Only 3 days remain in Lucky Magazine's "45 Days of Giveaways" contest, including today. Daily entries are also automatically entered to win a grand prize trip for two to Hawaii, complete with a $1,000 shopping spree! -I'm assuming this includes all three fragrances in the line, Dawn, Endless, and Twilight, but I guess we'll have to wait and find out! Not another Emergen-C! Oh, wait. That's a good thing. Here are two separate offers for samples of Emergen-C, including Emergen-C Blue, which helps benefit the Surfrider Foundation. Diana Krall will be performing live in New York City to promote the release of her 12th album, "Quiet Nights." Krall and her quartet will be accompanied by a 30-piece orchestra. The concert will take in the Winter Garden at the World Financial Center, at 1pm on March 31, 2009. This concert is free and open to the public, with no tickets required, so get their fast! Diana Krall will be back in New York at Carnegie Hall on June 23 and 24, but that's a concert you'll have to pay for. Only 4 days remain in Lucky Magazine's "45 Days of Giveaways" contest, including today. Daily entries are automatically entered to win a grand prize trip for two to Hawaii, complete with a $1,000 shopping spree! Spring has sprung! The days are longer, the air seems crisper, and the birds are back to chirping. It's finally time to break out some spring fashion. Take a look at the fashionable kids styles while you're there, I swear if I could fit into them, I'd be shopping in that department! Only 5 days remain in Lucky Magazine's "45 Days of Giveaways" contest, including today. Daily entries are also automatically entered to win a grand prize trip for two to Hawaii, complete with a $1,000 shopping spree! Friends and family is here again! This time it's Calvin Klein. Through March 29, you can save 30% off everything at www.calvinklein.com. The offer is also valid at Bass, Izod, and Van Heusen. 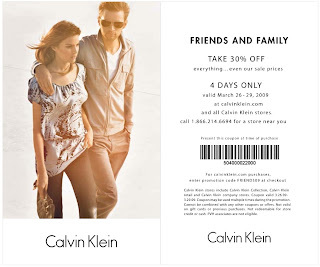 Just use promotion code "friends09" at checkout, or click this coupon to expand, print, and bring into a Calvin Klein brand store. You can also enter to win a $1,000 shopping spree from Calvin Klein at www.calvinklein.com/springshoppingspree. The winner will win a $1,000 gift card which can be used online, including free shipping. The card can also be used in Calvin Klein stores. You can only enter the contest once, until April 15, 2009. Kids Bowl Free program offers 2 free bowling games per day all summer. Plus, there's a deal for adults! 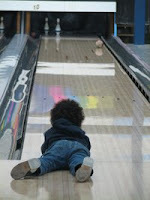 As a child, one of my favorite family activities was bowling. My brother was even in a bowling league, which I thought was kind of dorky at the time. He took it seriously, and I didn't, yet I would often get lucky. Still, he always won. This summer bowling alleys across the country will offer the "Kids Bowl Free" program, allowing children to play 2 free games of bowling per day for the entire summer. In addition, you can purchase a family pass, which would allow up to four adults to take advantage of two free games per day, with a one-time fee of $23.95. The program is described as being "designed by bowling centers to give back to the community and provide a safe, secure, and fun way for kids to spend time this summer." To sign up, visit www.kidsbowlfree.com. Click your state for a list of locations in your area. Participating locations are limited, but still widespread throughout the U.S., and you might be lucky enough to find one near you. Need to buy some coffee? How about a free coffeemaker to go with it? Gevalia coffee is offering a a free 12-cup programmable stainless steel coffeemaker, worth $89.99, and a free coffee scoop as a special gift when you try two 1/2 pound coffee packages for $14.95, along with free shipping. The offer automatically enrolls you in Gevalia's Coffee Delivery Program, which will continue to send four 1/2 lb. packages of coffee or tea every six to eight weeks, with prices ranging from $5.95 to $8.35 per package. If you want your free coffeepot, but don't want to be enrolled, just remember to cancel service after you sign up. The gift is yours regardless of whether you remain in the program or not. I can only imagine how difficult having a child must be, potty training, bad manners, messy rooms, I'm sure it can be challenging. I came across a clever promotion from Chuck E Cheese's to help reward kids for their accomplishments. Chuck E Cheese's offers downloadable calendars on its website, with the following topics: Tooth Fairy Award, Getting Dressed, Reading Rewards, Active Kid, Homework Helper, Potty Training, Sleep All Night, Magical Manners, Doctor/Dentist Good Patient Award, Stop Thumb Sucking, Clean Your Room, and Teeth Brushing. Based on the theme of the calendar, a child can mark off days after each goal is accomplished. Once the calendar and goals are complete, the child can bring it in to Chuck E Cheese's for a reward of 10 free tokens. While you're there, if your child has good grades, bring in their report card, and receive up to 15 free tokens with a food purchase. How's that for an incentive? I might need a couple of those calendars for myself! Feeling lucky? You should! Lucky Brand jeans is the latest to chop prices sitewide, offering 40% off your entire purchase through April 5. To receive your discount, use coupon code #9MARFF4 at checkout. If you really want to save, shop in the clearance section on the website. And remember that if you spend over $150, you'll get free shipping. Say cheeeeeese! Canon is offering free printed samples of your digital photos, to promote their printers and paper products. When you sign up at www.trymyphoto.com, you'll receive a free photo printed on Canon paper, on a Canon printer, by uploading a digital photo. The sample will be sent to you by regular U.S. mail within 10 to 14 days. As you sign up, you'll be asked to upload a digital photo of your choice to print. You'll also be asked what printer you'd like to test. Before you choose, take a look at the five options below, as there are different sizes and types of paper to choose from (the bigger the better, in my opinion). Paper: Canon Photo Paper Plus Semi-Gloss 8" x 10"
As a special bonus, you can request multiple samples to "compare products," by returning to the Request Free Sample page to see if other sizes are available. According to Canon, this is completely legit! Tax season is in full force, with less than 3 weeks left until the April 15 deadline. 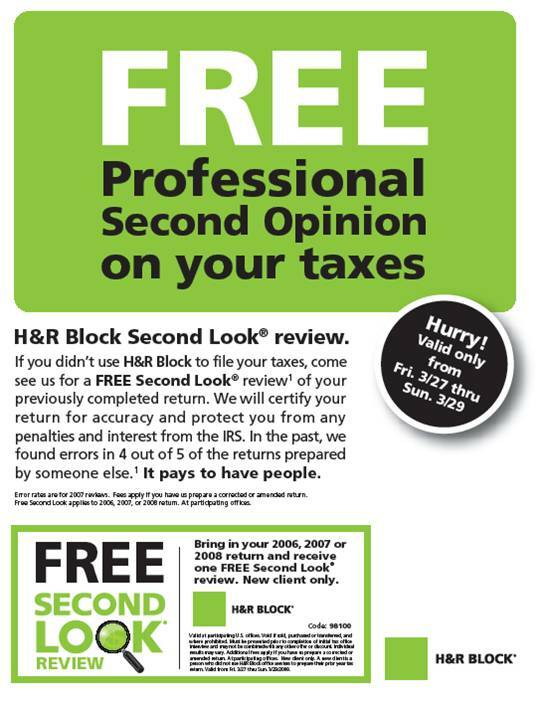 Just in time for the last-minute crunch, H&R Block is offering a free Second Look review of your tax returns, from Friday, March 27 through Sunday, March 29. 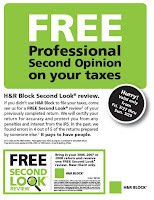 H&R Block will review not just one, but up to three tax returns including 2006, 2007 and 2008. They'll review the returns to make sure they are accurate, and help you avoid penalties and interest charges. The Second Look review is regularly priced at $29. To take advantage of this offer, you must be a new client, and be sure to set an appointment, as offices will fill up fast. You should also confirm that your location is participating in the offer before you get there. Print and bring this coupon with you, and keep in mind that it doesn't include the cost of changes that may need to be made to your return. Only 6 days remain in Lucky Magazine's "45 Days of Giveaways" contest, including today. Daily entries are also automatically entered to win a grand prize trip for two to Hawaii, complete with a $1,000 shopping spree! You never know when the next earthquake will hit, the power will go out, or, maybe you just need a light for trick-or-treating. Whatever the scenario, here's your chance for a free LED Glow Stick. When you sign up, you'll be offered 20% off other safety items, from safety packs, lanterns, and cell phone adapters, to accessories like thermal blankets and first aid kits. All I know is, they would have loved these back in the rave days. Flower delivery isn't very budget friendly, but there are times in life when its best (and fastest) to say it with flowers. To help with the cost of your next bouquet, 1-800-Flowers.com is offering a savings pass of $20 off, when you sign up online for e-mails about future promotions, sales and discounts. The coupon will be emailed to you within 7 days. Lingerie giant Victoria's Secret is the latest to jump in on the green trend, and as far as I'm concerned, the more the merrier. Immediately following natural product and incentive promotions by Sephora and Origins, Victoria's Secret introduces Naturally Victoria's Secret, its own line of natural bath and body products. The line is brand new, currently in stores, and will be available online at www.victoriassecret.com starting April 1. To receive a free mini Naturally Victoria's Secret body lotion, click here, print and bring into any Victoria's Secret store by April 12. While you're there, be sure to sign up for Victoria's Secret Pink Nation to receive e-mails about future offers, and you'll receive a free gift. I scream, you scream, we all scream for... You know the rest. Today only, Ben & Jerry's is offering $1 scoops of ice cream to those who donate a non-perishable food item. Bring a can, get a cone (or a 3 oz. cup). The offer is valid only on Tuesday, March 24, and food items will be donated to a local food bank. Friends and Family fever continues, and the theme this week is...shoes! OK, there's a little more than that. Luxury shoe and handbag designer, Kate Spade, has jumped on the coupon bandwagon, offering 30% off your entire purchase from March 26 through March 30, 2009. For extra savings, check out the sale section, where some styles have already been marked down as much as 75%. 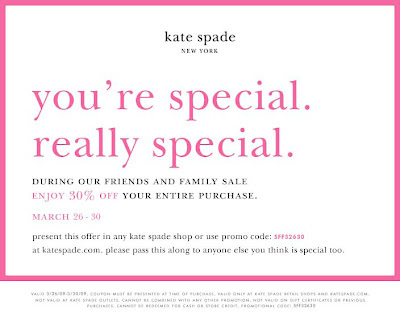 To take advantage of this special discount, click and print this coupon to bring into any Kate Spade shop. To shop online, use promo code #SFF32630 upon checkout at www.katespade.com. Still not enough? Stop by Reebok, Rockport, or Greg Norman for 40% off with the coupon below. Receive 40% off everything in the store, with this coupon. Just click, print, and bring to your nearest Reebok, Rockport, or Greg Norman. Offer does not extend to online purchases. Origins has introduced its latest initiative to go green, and according to the company, a "first in the cosmetic industry." Starting March 29, Origins begins its Return to Origins Recycling Program. Everyday packaging accounts for approximately 1/3 of all landfill waste. Most community recyclers only take items made from materials that are easily recognized - such as soda and water bottles. Everyone is tweeting these days, and Toys R Us (among others) have begun tweeting deals to Twitter followers. Toys R Us is currently tweeting an offer of $10 off any online purchase of $30 or more at Toys R Us and Babies R Us. The offer is valid on Tuesday, March 24, from 6am to 10pm E.S.T., and can only be used with online purchases. To take advantage of this offer, use coupon code "Twitterdeal24" at www.toysrus.com. Only 9 days remain in Lucky Magazine's "45 Days of Giveaways" contest, including today. Daily entries are also automatically entered to win a grand prize trip for two to Hawaii, complete with a $1,000 shopping spree! There may be no such thing as free lunch at Mimi's Cafe, but there is such thing as free breakfast. When you sign up for Mimi's E-club newsletter, you'll be emailed a coupon for a free breakfast entrée, not to exceed $10. The offer is offered to one person per party, per visit and expires within 15 days of when you signed up. So, don't sign up until you know you're ready to go! Receive $20 off purchase of $100 in groceries at Raley's, Bel Air, and Nob Hill Foods. 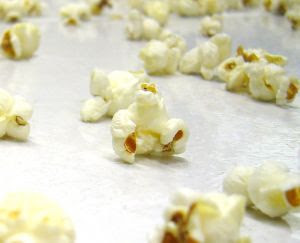 There are plenty of deals out there for the extras, but what about the necessities? If you're smart, you'll seek out deals from a variety of stores, and schedule your purchases around them. You can still buy the brands and items you prefer, if you stock up when they're on sale, or when there's a storewide coupon. Before you go, make sure to browse this week's offers to find additional coupons to take with you. Also, make a list of what you need or might want to save for a rainy day. For in-store specials, click here, and enter your zip code. I live by myself, so $100 is actually a lot for me to spend in one store, that is, if I'm spending it wisely. I'll be looking through my cabinets to see what canned and frozen items I can fill stock up on, and will finally let myself splurge on pricier items like fancy cheese and espresso. Speaking of, there's a coupon for $1 off Illy espresso, which is known for being one of the best coffees in Italy. To receive $20 off your purchase of $100 or more, print this coupon and bring it into the nearest store. Seize the Day at IKEA on Sunday, March 22 with one-day deals, free breakfast, and free coffee! If you're planning on making a trip to IKEA, today should be the day. Sunday, March 22 is the final day of IKEA's Seize the Days sale, with one-day, deep discounts on a few key items, among other savings throughout the megastore. While you're there, you can also grab free breakfast and coffee, a savings of $2 per person. Free coffee is enough to keep me happy for a while! Print this coupon, in case they ask for it. While you're there, swing through the mirror aisle, and see if they still have the LOTS mirror set for $4.99, another steal! There's been a new offer from Bare Escentuals buzzing around, and I finally got a chance to pick mine up. For a limited time, Bare Escentuals is handing out a free 10-day foundation sample. You can order the sample online with a $3.95 shipping fee, or pick it up in the store with a free consultation. Initially, the obvious choice was to go into the local mall. Why pay a shipping cost? It was actually more pleasurable than I expected. An associate walked me through the Bare Escentuals application routine, and showed me some great products, which were quite tempting. Following the consultation, I received my free sample. As I walked back to my car, satisfied with my latest freebie, I realized, wait! Where's the buki brush?! The sample was supposed to have a free brush, and I can't remember the last time I invested in a makeup brush. I went back, and unfortunately, the brushes were out. So, instead of finding another location to go through the process again, I went online to www.bareescentuals.com/peaceandlove/ and started to order my sample. Before I realized it, I had accidentally ordered two different shades. And it let me! So, I added another shade, and it maxed out at three. You can stock up by choosing different shades, or three of the same shade. Plus, it added a free sample of Bare Escentuals Rare Moisturizer. So, $3.95 later, I now have three samples of Bare Escentuals foundation on its way by mail, along with...you got it...a buki brush! Only 10 days remain in Lucky Magazine's "45 Days of Giveaways" contest, including today. Daily entries are also automatically entered to win a grand prize trip for two to Hawaii, complete with a $1,000 shopping spree! While we're on the topic of kids (no, I still don't have any), I found another freebie that'll make the perfect gift. The offer expires on March 31, 2009 or until supplies run out. The approximate retail value of the gift is $12.99. 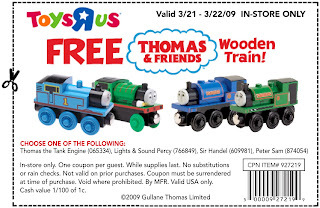 Coupon for a free Thomas & Friends wooden train at Toys R Us on March 21 and 22 only! I don't have kids, but I'm at that age where everyone around me is having them. So for now, I'm happy living vicariously through them, aside from the diapers and tantrums, of course. With nieces and nephews abound, a free toy offer is always welcome. I even have a box in my garage that I stock up with deals and freebies I find throughout the year. The latest freebie is a good one, and it's been been buzzing around Twitter all day. It's a free Thomas and Friends wooden train, and you get your choice between Thomas the Tank Engine, Lights & Sound Percy (awesome! ), Sir Handel, and Peter Sam. Even I know that's a good offer, and one that nobody will ever know was free! The perfect stowaway gift. To print your coupon, click HERE, and bring it to your nearest Toys R Us store this Saturday, March 21 and Sunday, March 22. To find a Toys R Us store near you, click HERE. Win a Foley + Corinna gold handled tote from Lucky Magazine. Today only! Now this is a tote that I want! Only 11 days remain in Lucky Magazine's "45 Days of Giveaways" contest, including today. Daily entries are also automatically entered to win a grand prize trip for two to Hawaii, complete with a $1,000 shopping spree! Receive 25% off everything in the store, with this coupon. Just click to enlarge, print, and bring to your nearest Juicy Couture retail store. Offer does not apply to online purchases. A few years ago, I designed club fliers for extra cash. Back then, a club owner told me about an online printing company with great deals, PS Print. Club flier printing was their main operation, and they offered 5,000 4” x 6” 4-color double-sided postcards for $199, a huge deal at the time. Nowadays, that would cost closer to $150. As PS Print has progressed over the years, I’ve continued using its services. They’ve grown from printing club fliers and posters, to everything from calendars, door hangers, event tickets, banners, decals, and more. They even offer automatic mailing services for direct mail. While their services have expanded, they continue to remain the best deal around. They also offer inexpensive short runs, such as business cards starting at $9.95 for a set of 50. Until March 31, PS Print is offering 40% off brochures and 30% off posters. This is a massive discount, considering the affordability of their original pricing. Orders can be calculated and placed online at PsPrint. Discounts are automatically applied when items are placed in the cart, with no coupon code necessary. Now, let’s look at this for a moment. Let’s say you want 1,000 brochures, full color on both sides, printed on matte stock paper, with a tri-fold. The original price would be $257.01, not bad. But after 40% off, the price is reduced to $154.20, even better! Or, how about 50 11” x 17” posters? Originally, that would be $57.07, but the 30% discount brings it down to $39.94, a steal! 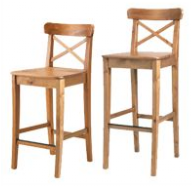 Now try this, when you get to checkout, enter this coupon code: asale12. It should give you an additional 50% off your order. Just be careful, as sometimes it will automatically remove the existing discount. I tried it with the brochures, and it worked, bringing the total down to $77.10, but when I tried it with the posters, the original 30% off disappeared. But, I guess 50% is still better than 30%, right? You can also try combining your offer with code #asale08, for an additional 25% off, and see which combination works best. As for shipping, the longer turnaround, the cheaper the price, so try to schedule 5 days for printing. Or, if you live in the Bay area, you can save more by arranging to pick up your project at will-call at the PS Print warehouse in Oakland. 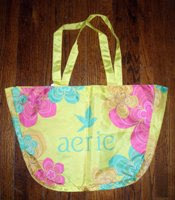 It's Thursday, which means today's the day to pick up your free gift from Aerie, just for being on their A-List. Well, here it is! Another tote. I have to admit, I'm a little toted out, but at least they give you the option to win another free gift with an instant scratcher, as long as you try on a bra. One bra try-on and a few scratches later, I walked out of the store with a coupon for $10 off any purchase, and another free tote. (Wasn't Victoria's Secret's PINK handing this out last week?) Other possible prizes include a free undie, free bra, or $5 off any purchase. Win a year of shoes from Piperlime. Today only! Piperlime is hosting a major shoe giveaway today, offering a year of free shoes to the winner. That's one $250 giftcard per month! For a total of $3,000 for the year! To enter to win a year of free shoes from Piperlime, click here: http://piperlime.eprize.net/weekoftreats/index.tbapp You only get one chance to enter, but if you email the offer to up to 5 friends, you'll receive one additional entry per friend. There's plenty of talk about greening our diets, but what about greening our cosmetics? If we care so much about what we put in our bodies, what about what we put on them? And if we want to go green, which products last longest and achieve the best results? To help you answer these questions, Sephora is hosting the "Get Naturally Gorgeous!" event on Saturday, March 21, from 12 to 6pm. The event is open only to those in the "Beauty Insiders" club, which can be joined HERE. Call in advance to schedule a complimentary one-on-one consultation with a Sephora expert, and walk away with a goodie bag stuffed with 8 green beauty product samples. Looking for a fresh scent? Can't decide between Essence Narciso Rodriguez, Escada Ocean Lounge, Giorgio Armani Onde Vertige, Kenzo Eau de Fleur de Thé Tea, Flora by Gucci, or Dawn Sarah Jesica Parker? Throughout March, you can enter to win all 6 fragrances, worth $446, from Cookie magazine. Just click HERE, fill out the form, and cross your fingers. After a long day of work and no groceries in the fridge, I lazily stopped at Jack in the Box. The drive-thru was backed up with at least 8 cars and an empty parking lot. Typical. I was lazy, but not that lazy. Once inside, I was instantly greeted by a robot. Ok, it was a machine, with a sign that read “2 free tacos with any kiosk combo purchase.” That was enough for me to interact with it. I promptly ordered my combo meal via touch screen. It yelled the selections at me to confirm, I swiped my card, and the order was sent to the kitchen. All of this occurred while business carried on as usual at the other "manned" registers. So, I got two free tacos for skipping the line and using the kiosk to purchase my combo. I just hope nobody loses their job because of it. After all the celebration yesterday, you're likely in need of another boost. Here are some free vitamin and supplement samples to collect for next time you need them. 40% off at Kenneth Cole. Today only! Setting the mood for celebration this St. Patrick's Day, Kenneth Cole stores are offering 40% off your entire purchase, today only. The discount is valid at Kenneth Cole New York retail stores, 1-800-Ken-Cole and www.kennethcole.com...just a hop, skip, and a click away! Free Origins lipstick and free shipping with any online purchase. Today Only! Only 15 days remain in the "45 Days of Giveaways" contest, including today. Daily entries are also automatically entered to win a grand prize trip for two to Hawaii, complete with a $1,000 shopping spree! I busted one of my tires on the freeway last week, and can't help but wonder if the air level was too low. I'm not the best when it comes to car maintenance, but it might help if I had a tire gauge, or even knew how to use one. Well, lucky me, because Buell Motorcycles is giving away free tire gauges, while supplies last. All you have to do is sign up for email HERE, print your coupon, and bring it in to your nearest Buell Motorcycle dealer by April 18, 2009. Make sure to call in advance to make sure they haven't run out. Thanks to another late-night tweet last night from Sweeties Swag, I found out about yet another freebie giveaway. For a limited time, ViX swimwear is offering a complimentary tote when you sign up online to become a ViX ViP. You'll also be emailed a 20% coupon for the ViX online store. Matrix is currently offering free Biolage Rejuvatherapie samples, when you enter the Biolage Rejuvatherapie Spa Getaway for Two contest. The prize is a stay at a luxurious spa for 4 days, and 3 nights for two people. The website doesn't say exactly what the free Biolage Rejuvatherapie sample is (shampoo, conditioner? ), when the contest ends, or where the spa getaway is. A little irritating, but I guess we'll just have to enter and find out! With spring only a few days away, barbecue season is just around the corner. Weber Gas Grills and Grate Chef can help you stock up, thanks to barbecue related giveaways from both companies. Weber Gas Grill is currently offering a free spatula/turner to the first 7,000 people who sign up on their website. It's easy, just visit www.webergasgrills.net, and complete the form at the bottom of the page. Ahhh, I can almost smell the charcoal in the air already. Feeling a little slow? Need an extra boost? How about some free vitamins? Nature Made is offering a free 14-day supply of liquid softgel vitamins, while supplies last. You can choose one of the following options: Calcium, Multi-Complete, Multi-For Her, Super B-Complex, Vitamin C, and Vitamin D.
To get your free 14-day supply, visit www.lsg.naturemade.com/naturemade/default.aspx and click on the vitamin of your choice. Here's the free gift from Victoria's Secret PINK! Starbucks Runs Out of Coffee Samples. WTF? !